In the North Cotswolds, within an Area Of Outstanding Natural Beauty, Orchard Cottage is tucked away in the grounds of a 14th century hall house which was the home to the writer and engineer LTC Rolt. Orchard Cottage stands in an old fruit orchard where some of the great perry pear trees so characteristic of this slope of the Cotswolds still survive. Fresh limestone spring water makes incomparable tea, and a small group of pure bred Cotswold bred sheep graze nearby. Stanley Pontlarge is a hamlet of six houses and a small Norman church at the end of a lane. Beyond the nearby farm buildings, a hill track, leads over Stanley Mount to Winchcombe, one time capital of Mercia, an historic stone town with a fine wool church and now a conservation area. The cottage provides direct access to many footpaths making it an ideal base for walkers. Orchard Cottage has a simple single floor layout. It will sleep four, ideally two adults and two children. The main bedroom has a double bed (which can on request be made up as two singles). The second bedroom has two full sized bunk beds. The bathroom is ensuite with the master bedroom. To access the bathroom from the second bedroom you have to pass through the main bedroom. The cottage is equipped with electric wall heaters and underfloor heating in the bathroom. There is a recently installed wood burning stove and there are additional free standing heaters. There is free wifi. The cottage has a delightful south facing secluded garden with outdoor seating and a barbecue. Tim Rolt lives with his partner and two children in Bath. Orchard Cottage is set in the grounds of his childhood home at Stanley Pontlarge. The cottage was originally built in the mid 1950's for Tim's grandmother. I inherited this property. It is set in the grounds of my childhood home. It is a rural bolt hole, a place of tranquility and peace set on a the side of a hill on the Cotswold edge. It is great walking country with many lovely walks accessible directly from the cottage. It is also very convenient for many of the attractions offered by the Cotswolds. Principally this is a place of real peace and quiet. Set well back from the dead end road in an old perry pear orchard, Orchard Cottage offers a complete get away. With 360 degree rural views, the cottage windows provide the sight of a huge variety of wildlife. With direct access to open countryside there are many beautiful walks from the door - making the cottage ideal for walkers. The cottage is conveniently placed for most of the attractions of the cotswolds. En suite to bedroom one, the bathroom has a cast iron bath with shower over, toilet, heated towel rail, sink, shaving socket, and extractor. It is equipped with underfloor heating. With rural views all around the generous sized sitting/dining room has a newly installed wood-burner to keep you snug and cosy. Double patio doors open into the garden. There is free wifi and digital freeview with dvd player. Very well equipped kitchen with electric hob, microwave and fridge. Many local interest books in a carefully selected library. Visitors bringing bicycles may park them in an open barn to keep them undercover. Cleeve Hill golf course 3 miles. Notes on accommodation: This is a no smoking property. Well behaved dogs are welcome and will be well exercised on the pleasant walks around. (there is an additional charge of £25 per dog per week). Outside: With rural views all around, your own enclosed south facing private garden is supplied with a variety of outdoor seating, a picnic table, and barbecue making it the perfect place for al fresco dining. Orchard Cottage sits on the lower slopes of Stanley Mount where numerous footpaths can be accessed directly from the cottage. There are many delightful rural walks within direct access of the cottage, so leave your car behind and head for the hills! Cleaning / Towels / Linen / Maid service: All bed linen is provided and included in the rental. The cottage is cleaned once a week and we ask visitors to, as much as possible, leave the cottage in the condition in which they found it. Really characterful cottage. Extremely quiet. Well situated for visiting the local sights. Would definitely come again. Le cottage est tout à fait charmant, avec un petit jardin permettant de pique-niquer au dehors. Le jardin fleuri fait penser aux dessins de Béatrix Potter : on attend que Tom Chaton sorte de la grange rencontrer Sophie Caneton... La décoration intérieure est cosy et fidèle aux photos. Les enfants adoreront les moutons, les écureuils, les ânes, le faisan et le chat qui environnent le cottage, sans oublier le train à vapeur qui enprunte régulièrement la voie qui passe à proximité. Ideal size for 2 adults and 2 children with dog. Very basic with no real chic style, but the place is an honest functional retreat away from the busy world. Comfortable bed and living space with all the kitchen amenities to cater if necessary. Outside space was dog friendly after a few modifications, and the neighbouring sheep were welcome distraction to our dog. What I loved most was the history associated with the host's adjacent home, together with what must be 4 decades of visitor books to the cottage. We would definitely stay again as the location is well placed to explore The Cotswolds. The images are when the cottage was in a better state of repair - so be prepared for this. Small, basic kitchen. Old fashioned but nice bathroom. Cosy. Lovely situation. Lots of peace and quiet. Many birds. Heritage steam trains run along bottom of garden. Winchcombe is about 1 hour walk and has everything you might need. Half hour walk to nearest pub restaurant. Beautiful area with lots to see and do. Many footpaths though signage a little lacking! This is a great cottage if you like walking and the sound of the occasional steam train at the bottom of the garden. The views from the top of Langley Hill above the cottage are superb. It is simply appointed - no washing machine or dishwasher - but the wood-burner is brilliant. It is really a two adults and two children cottage, but three adults would be comfortable. Also it is very dog friendly. The Royal Oak in the nearby village of Gretton is recommended. Close to the Gloucester & Warwickshire Steam Railway. (Toddington 2 miles) Also within one mile of Prescott Hill Climb historic motor sport venue. Close to Cheltenham racecourse venue for the Gold Cup and other horse racing events. Cheltenham Literary Festival. Cheltenham Music Festival. Two and a half hours from London, 2 hours from Heathrow, 3 hrs from Gatwick, 1 hr from Birmingham International, 1 hour from Bristol airport. 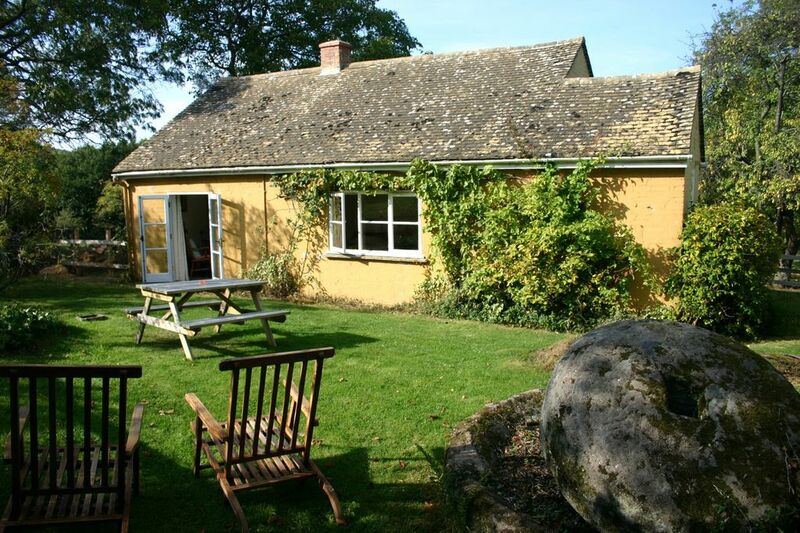 Three miles from Winchcombe, Orchard Cottage, makes an excellent base for all Cotswold and Midland expeditions. Tewkesbury (8 miles), Cheltenham, (8 miles, and its famous race course 7 miles) Stroud, Chipping Camden etc. all have Festivals of Music, Literature, Arts and Crafts. The famous motor sport venue Prescott Hill Climb is less than 1 mile. As is the heritage steam railway the Gloucestershire and Warwickshire Railway. Lovely pubs providing food include nearby- The Royal Oak (Gretton 1 mile). Nearest supermarket Bishops Cleeve (3 miles) Banks; Winchcombe (2 miles) Bishops Cleeve (3 miles) Attractions. Sudely Castle (2miles) Broadway (6 miles) Gloucester & Warwickshire steam Railway (Toddington 2 miles) Cotswold Farm Park (8 miles). Cheltenham (8 miles), Tewksbury (8 miles). Hospital - Cheltenham 8 miles. Booking Notes: To secure a booking a deposit of £100.00 is payable in advance. The balance of the rent is payable one month prior to the week(s) of the holiday. Payments can be made either by cheque or by internet or phone. Changeover Day: Saturday to Saturday. Arrival time 4pm departure time 10 am. Notes on prices: The rental listing is all inclusive of bed linen towels and electricity. Short breaks in the low season are a minimum of two/three nights. PLEASE ENQUIRE FOR SHORT BREAK RATES. There is a winter fuel surcharge of £25.00 per week. There is a charge of £25.00 per week per animal for pets.